On summer days a blue sky arches over the plain landscape of the Baltic Sea island Fehmarn. If you cross the Fehmarnsund Bridge on such a day, you see to the west in 10 km distance the steeple of the Johanniskirche towering over Petersdorf. The belfry was rebuilt after a fire in the 16th century and has a height of 64 metres. Therefore it is the highest steeple of the island and belongs to the early gothic brick hall church St. Johannis from the 13th century. Considering its dimensions the church is a lot bigger than ordinary village churches of northern Germany. The villagers lovingly call it their "cathedral". They love their church in the village centre, even though they would consider it strange to visit services too often. The interior of the church holds an exceedingly rich furnishing. For instance the winged altarpiece is one of the most eminent examples of the gothic wood craft in Schleswig-Holstein. Also unique is a tabernacle of the 15th century. With the construction of the Fehmarnsund Bridge in 1963 a connection to the mainland was established for the railway and traffic. Since then summer tourism has developed and "concerts by candle light" are held in the Johanniskirche in Petersdorf. During the summer months from July to September, one to two concerts are held during the week, mostly with smaller chamber music ensembles, but also with soloists accompanied by the organist Christoph Jessen. The concert evenings are visited mainly by tourists who are impressed by the atmosphere of the church interior and intently listen to the music, which sounds as if the musicians floated through the room along with the music, enhanced by the special acoustics. 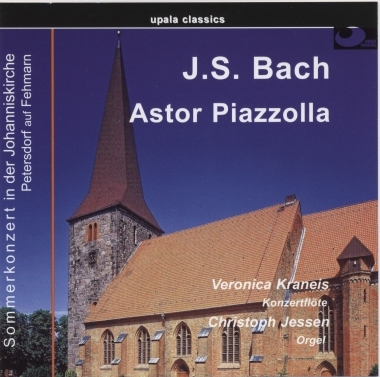 With this live recording upala records documents an excerpt of the creative cooperation of the flautist VERONICA KRANEIS and the organist Christoph Jessen (a native of the island of Fehmarn). In the course of the last ten years the two artists astonished their audience again and again with unusual adaptions of J. Rheinberger, Franz Schubert, W.A. Mozart and especially J.S. Bach. Special attention was given to their concerts where they interweaved the masterpieces of J.S. Bach and Astor Piazzolla. All presented pieces (except for BWV 533, Präludium and Fuge e-moll) are arrangements by the two artists for flute and organ. A live recording is always accompanied by non-avoidable ambient noise like e.g. the "banging" organ registers and the noise of the audience. We apologize for this and ask you to engage yourself in the liveliness of the concert recording. The organist CHRISTOPH JESSEN already received substantiated instructions in playing the piano and the organ during his time in grammar school. In addition to his studies of the subject SMP at the Conservatory of Music in Hamburg, Christoph Jessen attended singing lessons (tenor) with Birgit Calm and Ute Niss. After his participation in the regional church music courses for church musicians in Bad Segeberg (directed by Jürgen Frielinghaus and Dörte Czernitzki), Christoph Jessen was catechized as church musician. Since 1991 the organist is cantor and organist in the church of St. Johannis in Petersdorf and regularly participates in the "concerts by candlelight". Furthermore, numerous concerts as organist and singer (tenor) led him to many regions in East- and West-Germany, Russia, Latvia, Sweden, Austria, Denmark and Spain. The internationally acclaimed flautist VERONICA KRANEIS (concerts led her to countries like Australia, Japan, North and South Korea among others) is not only well-known for her genre-crossing repertoire (from classical music to tango and jazz), but she is also praised for her exceptional and virtuosic performance with all three flutes (concert flute, alto flute, bass transverse flute). The sound spectrum of these instruments offers an enormous variety of adaptions of existing music as well as first releases of compositions dedicated to the artist by contemporary composers (Barbara Heller, Jaime Zenamon, Herbert Peter et al.) In cooperation with organists at home and abroad (in Germany with Matthias Eisenberg, Michael Gerisch, Thorsten Pech among others) the artist again and again arranges spectacular concert projects. "The flute as additional register to the organ" offers a variety of musical opportunities for the artist. You can experience a small excerpt on the presented recording.